A little peek into the life of this ginger. Which is sad because today is the 29th of December. In truth, it started to look a lot like Christmas a few weeks ago, but then it got stuck and just stayed there. I’ll probably remember this year as the “3/4 Christmas.” It just never really got off the ground at my house this year. I really want to be more like Martha Stewart and her crafty staff. I really do. I dream big, but it ain’t happenin’. If you want to keep reading, you can see how much growth I have ahead of me. 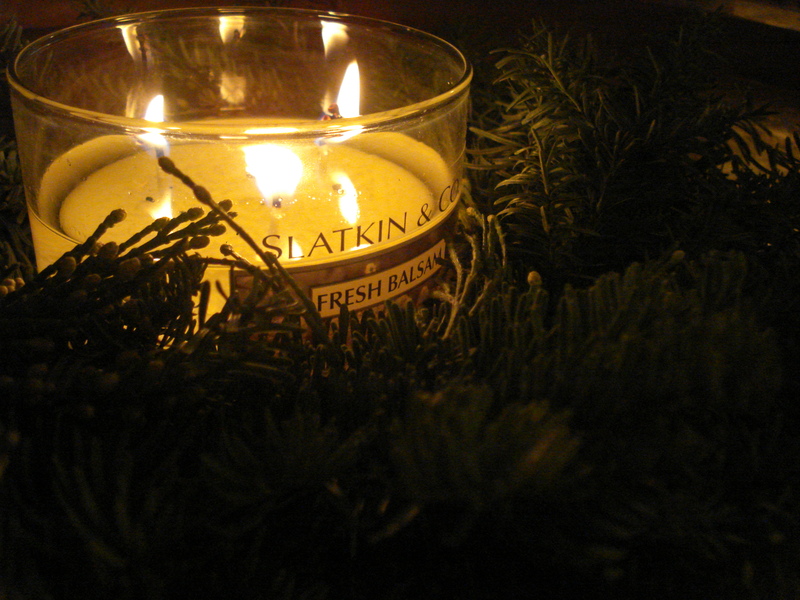 It’s a Slatkin & Co. Fresh Balsam scented candle from Bath and Body Works in the center of an evergreen candle ring that I bought through a fundraiser. The idea was that since our tree is artificial and our house would lack the amazing smell that comes with a real tree, this little number would serve as a replacement. It totally works, too. The candle smells exactly like I want it to, fresh and seasonal. 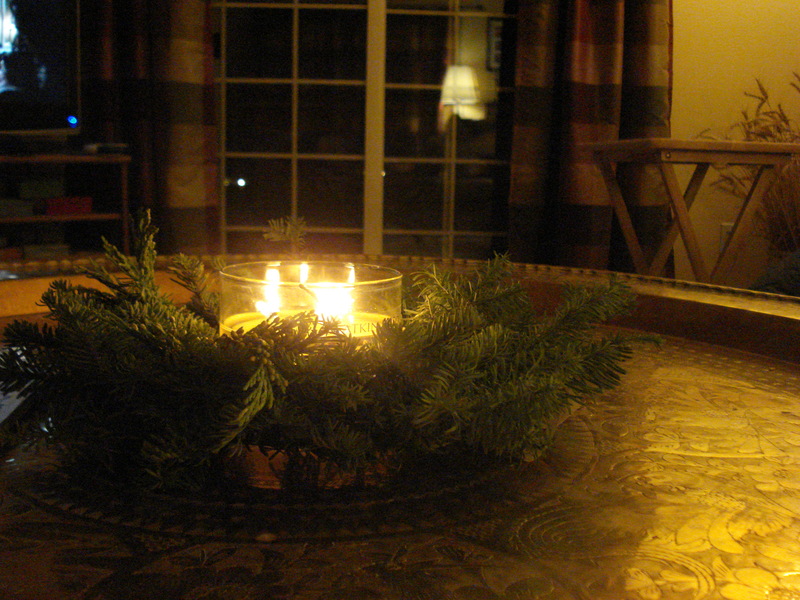 Then it also heats up the candle ring and makes it smell exactly like a Christmas tree because, well, it’s literally chunks of tree twisted into a ring. That’s it, though. That’s the height of the Christmas decor around here. The best we’ve got. No foolin’. Kirstin won this gem in a white elephant exchange. I loved it immediately. You’d think it was solid bronze, right? And way too heavy to hang on a single nail, clearly. You’re probably thinking, “How did those girls get that to hang on the wall?” Well, it’s plastic! Molded, thin, gold-colored plastic. Shocked? Yeah, me either. The heart-breaking news is that it only lived on the wall for a couple of days until Kirstin re-white-elephanted it at another exchange. 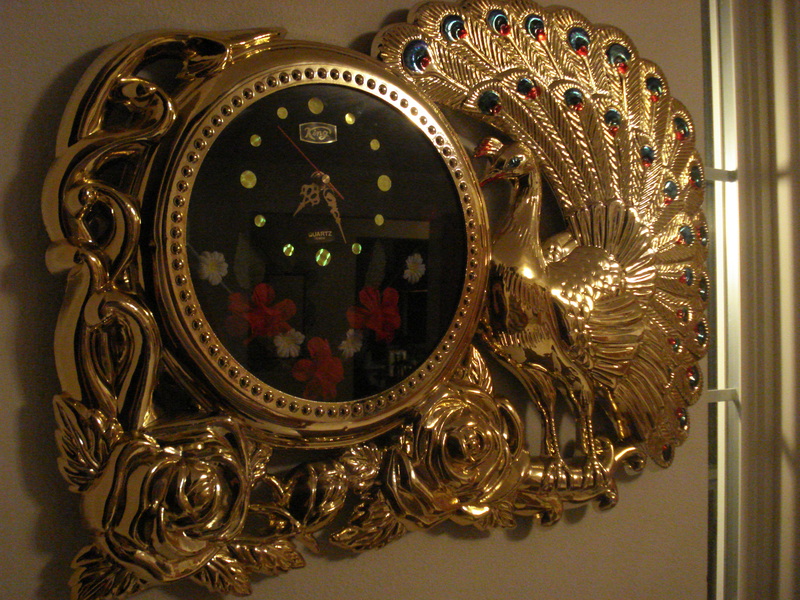 Peacock Clock went to live with a new family. This is Glitter Mary. Glitter Mary will live with me forever. 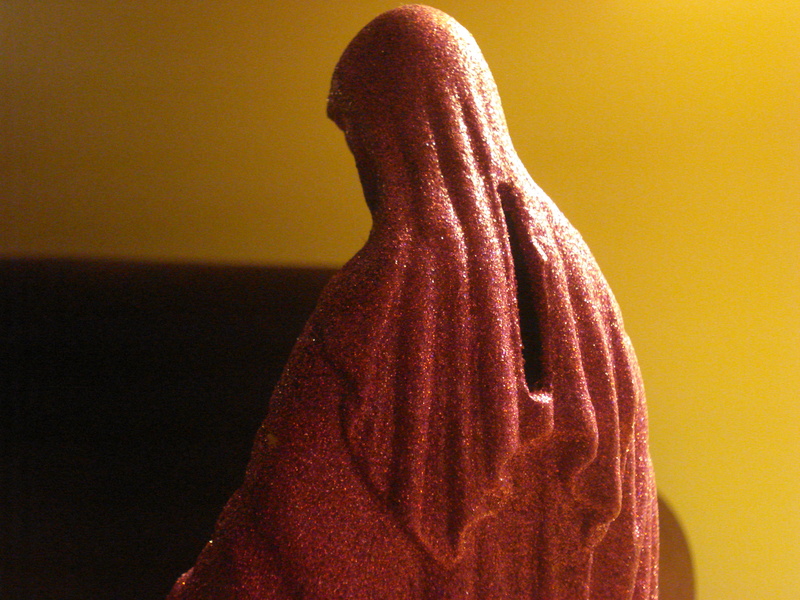 Here’s something shocking: Glitter Mary was also a white elephant gift! I did not re-gift her, though. I hid her under my chair during the rest of the exchange so no one would steal her. Also, Glitter Mary is a bank. 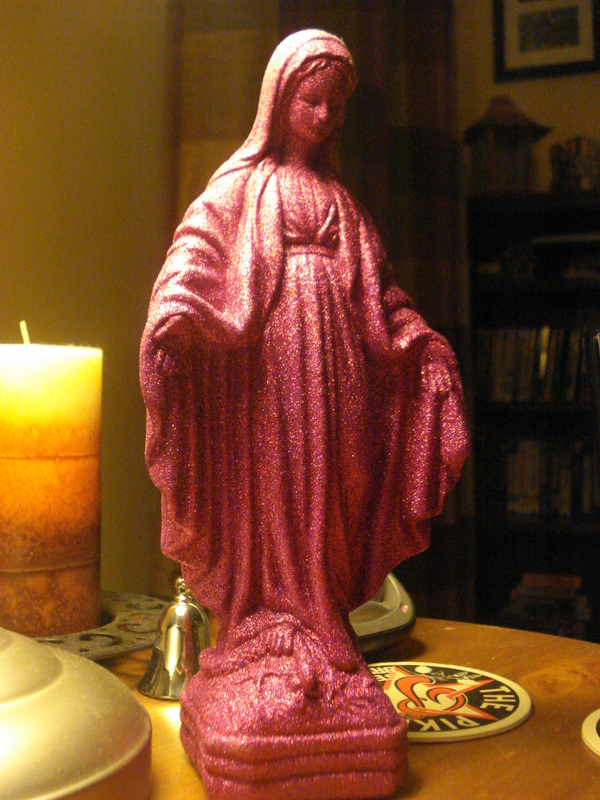 The thing that I don’t really understand about Glitter Mary is that she’s from Borders. She’s sold as actual Christmas decor next to a purple Glitter Jesus. When I was in high school I went to Ensenada, Mexico, with a group from church to help do some building. On the way back up to California we were stuck in traffic in Tijuana. Folks were wandering between the vehicles selling all kinds of things: roses, chiclets, and molded plaster in the shape of The Last Supper, totally covered in glitter. A Glitter Last Supper on the streets of Tijuana? Ok. A purple and pink Glitter Holy Family at Borders? That’s weird. So, Glitter Mary is weird, but I love her. I can’t really explain why, I just do. 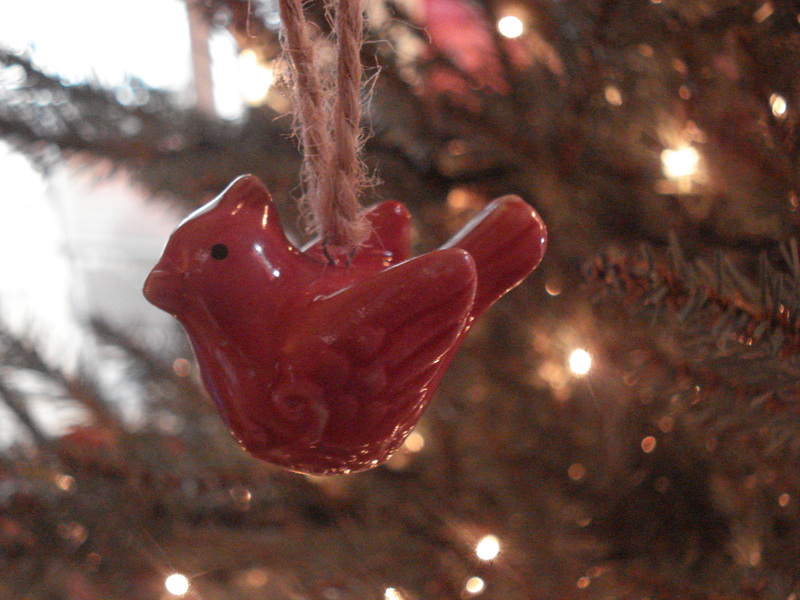 She’s a part of the Christmas decorations around here and that’s a pretty small group. In fact, I think you’ve seen it all. Let’s think…candle ring, peacock clock, Glitter Mary…oh, and our 3/4 Christmas tree. It’s only 3/4 of it’s full height, for real. Here’s what happened: A couple of weeks before Christmas my friend Marissa came over on a Friday night and we ate cookies, drank Jubelale, listened to Christmas music, and fully intended to put up the tree. It’s an artificial tree and you have to attach each branch individually. Also, it is not pre-lit. Last year we put the tree up and then I strung all the lights. It scratched my arms up and I ended up being short about one string. I solved that problem by leaving most of the branches on the back bare. This year I thought I’d be smart by stringing the lights as we went along. 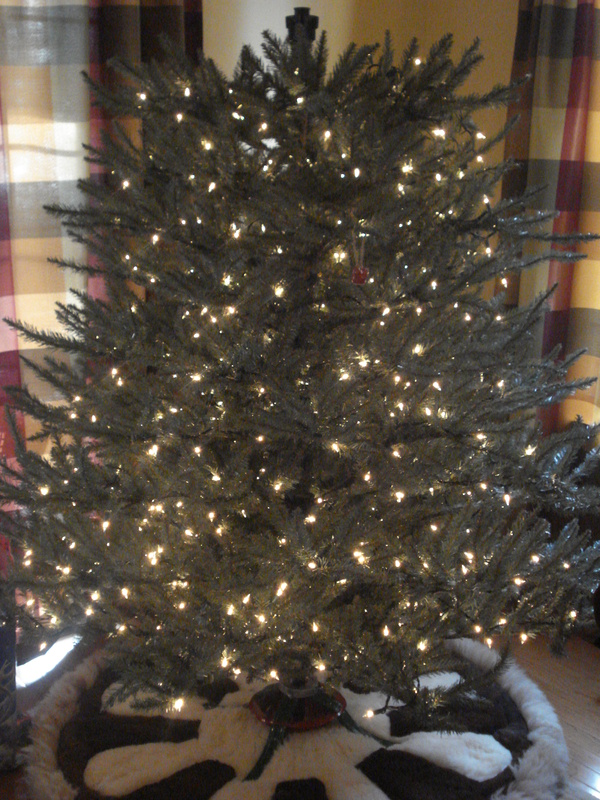 The issue was that I was still short a string of lights, even though I’d barely lit the back branches. By the time we got to the end of the lights, we’d been plunking in branches, stringing lights, and eating cookies for at least two hours. We decided that it’d be a great time for a break and a chat, thinking that I could run and get another string of lights and finish it up sometime in the coming week. Well, clearly that never happened. We’ve had 3/4 of a Christmas tree up in our living room ever since. But that is all. Martha and her crafty staff would be completely mortified to be me, I’m sure. That’s ok, though. If the purpose of my work day was to dream up ways to use jello molds to construct outdoor luminaries (I’ve seen it), then I’d expect more of me, too. But it isn’t. The purpose of my work day is to get kids to stop licking the table long enough to learn how to read. So, anyway, Merry Belated 3/4 Christmas, everyone! I love you, too!! Get your blog started. I want to read all about your adventures in San Fran! Thanks for stopping by. I'm so glad you're here! As a kid we had one of those Dutch doors where the top half could open independently of the bottom half. I always loved when folks would lean halfway into the kitchen to chat. In my head, Through the Ginger Window is just like that. I'm inviting you to lean into my life through my open window. So let's chat! Consider each post an invitation to conversation. I'd love to hear from you. 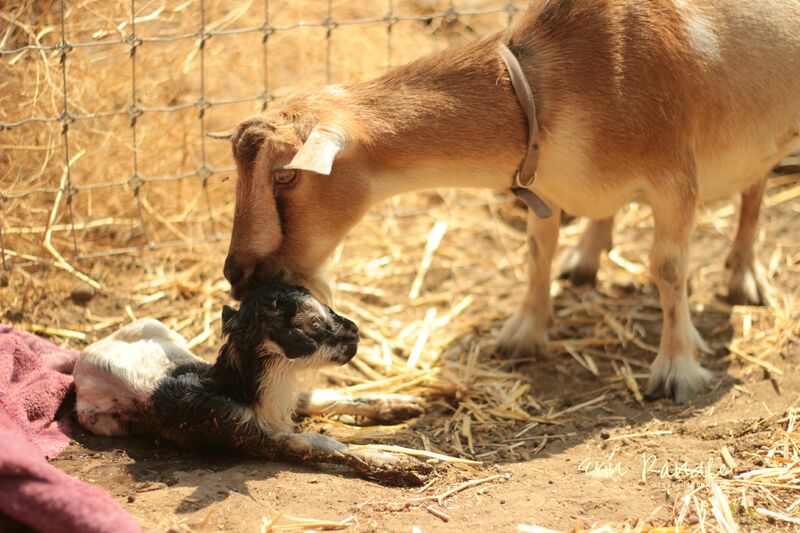 Livestock birth photography is not a thing…yet. Livestock birth photography is not a thing...yet. When I scroll by a post that's NOT about snow I get legit upset. This weather event feels so all-encompassing I forget the whole world isn't also experiencing it with me. "I don't care about how your essential oils calmed you down while you installed your bespoke Mediterranean bathroom tiles, Lisa! It's SNOWING." ... Oh, you live in Pheonix and that's your real life... terribly sorry, carry on... Anyway... ☝🏽That's my niece eating snow. Follow me on Pinterest You know…only if you wanna. Don’t let me boss you around. Chelle Nicole Photography Friend and photographer, she brings out the beauty in everyone. Grace Upon Grace My good friend Lauren’s thoughts on life and the Lord. Jen Hatmaker Author, speaker, blogger, wife and mom, all-around authentic, inspirational, and hilarious. Pioneer Woman I adore this blog. Read it. Make her cinnamon rolls. The Brain Scoop Watch this. But only if you like learning and science and aren’t easily grossed out.